Whatever you choose to call it though, it’s delicious and makes a great work lunch with a salad of flavoursome mixed leaves. I used dried kidney beans, and the hot soak method (as usual I was still thinking through what to cook the night before so didn’t set anything soaking…). The beans wrinkled and started to split after 30 minutes or so, not a problem particularly but I did a little research on why that happened. It seems that a short soaking time with not enough water could be the issue, but I think the hot water played a part too. Still, I added more soaking water (the amount in the recipe reflects this), and they turned out beautifully! 200 g brown basmati rice, rinsed. First soak the beans, I did mine in hot water for 5 hours. When the beans have soaked, preheat the oven to 170 degrees c.
In an ovenproof casserole pan with a lid, bring the beans and about 500 ml of water to the boil. The beans should be covered with around 5 mm of liquid. Boil for ten minutes. Cover the pan and transfer to the oven for 45 minutes. Take the pan from the oven and add the rice, mixing well. Add a further 500 ml or so of hot water, the rice and beans should be covered by 1 cm of liquid. Add the vegetables to the pan. Don’t stir! The vegetables sitting on top will steam, allowing the rice to absorb the liquid evenly. Return to the oven for a further 30 minutes. Remove from the oven and mix everything together with the salt, pepper and lime juice. 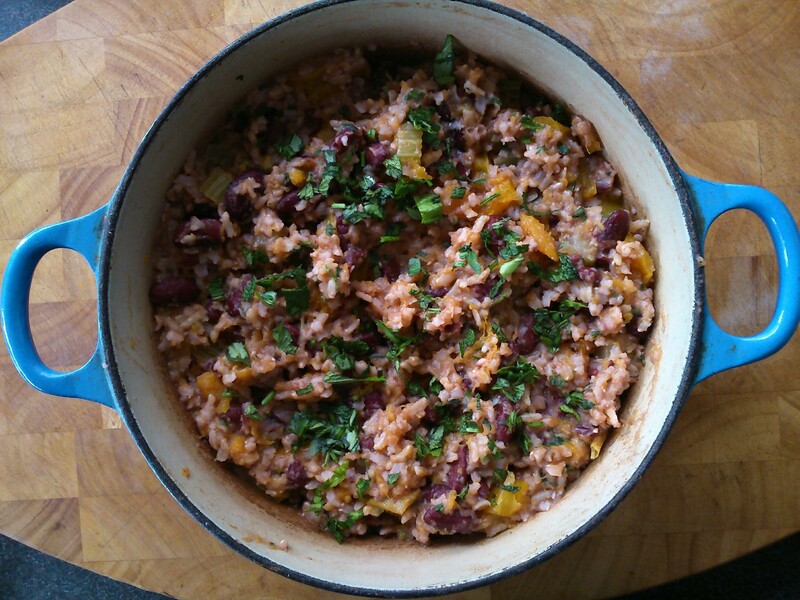 By this point the rice and beans should be tender and the vegetables cooked through. Cover the pan, and leave (off heat) for 20 minutes to allow the rice to absorb the very last bit of liquid. Stir the herbs through, and check the seasoning before serving.